"An image is worth a thousand words". I believe most people have heard this saying before. But what does it mean for teaching and learning? How can we use images (and imagination) in the classroom? One possibility comes from a very influential theory mainly developed by Allan Pavio (1) – the Dual-Coding theory. Simply put, the theory suggests that it is easier to understand something when we combine verbal and non-verbal elements. As an example, imagine you are talking about parts of the brain to a class of 14 year-old students. You can extensively describe where the cerebellum is located... but isn`t it easier – and more effective – to exchange part of the verbal description for the diagram below? Our working memory (the type with limited capacity and that stores information as long as it's being used to complete a task) is formed by verbal and visuospatial components. When we manage to combine the two, understanding is facilitated. That is, images enhance learning when they complement the text. When they don’t, we may end up overloading both components, reducing our working memory performance. So we know that the use of images can significantly improve learning, but what about mental images? Do students benefit from imagining a visual representation of the to-be-learned content as much as by seeing an image? In a classic study (2), a memory experiment was conducted on the beach. The researchers asked participants to memorize a list of words in two conditions: one on dry land and the other while scuba diving. The next day, participants were asked to recall all the words. The results were clear: Words learned underwater were better remembered underwater and words memorized on dry land were more accurately remembered on dry land. These findings have been replicated in different settings and suggest that the more your study and test environments overlap, the better your memory is. Recently (3), researchers investigated if the same effect would be found when participants mentally recreated their study environments during testing. In this experiment, participants were asked to study pairs of words (e.g. carrot-girl) that were superimposed to a photograph of a location (e.g. cinema, library). Later, participants saw one of the words from the pair and had to recall the other one. There were two things that differed during the memory test. The first one was physical versus mental images. That is, half of the time the photographs were presented, and for the other half, participants were asked to imagine the location in as much detail as possible. The second thing that differed was matching and non-matching images. That is, half the time, participants saw/imagined locations that matched the photograph of the location that was behind the studied words. In the other half, participants worked with locations that did not match. The results of this experiment showed that when the study and test locations were matched, performance significantly improved. Although this finding nicely replicates earlier investigations, there was another fascinating discovery: The effect did not differ between the physical and mental image trials. In other words, the benefits of imagining a location were comparable to the benefits of experiencing that location again. This may be good news for schools. 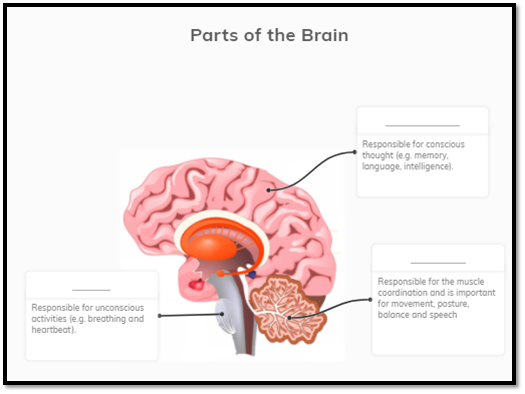 It is likely that the diagrams, images, and photos used in class to teach a particular content will help students remember that content during the exams, even if they no longer have access to the image during testing. Another recent piece of research (4) found similar results. In that study, 204 university students were asked to listen to 20 statements that were completely new to them. Half of the participants were instructed to rate how easy the statements were to pronounce. The other half rated how easy it was to form a mental image of the statement. With this manipulation, the experimenters prompted participants to either focus on the auditory elements or on the imagery elements of the statements. Then, students answered a series of questions about the statements. Results showed that the group prompted to mentally visualize the statements answered the questions two times more accurately than the group that focused on the auditory information. (This research also demonstrated that students’ “learning styles” had no influence whatsoever on their performance, but this is another story!). These findings suggest that mental imagery is an effective learning strategy and that stimulating students to do so, rather than focusing on the words only, may enhance their understanding of the content. The use of images and imagination has also been shown to facilitate reading comprehension. A literature review (5) concluded that creating images of texts helps students of different age groups to understand the texts. This appears to be true when the images are drawn on paper and also when they are imagined. In the case of drawings, children seem to benefit from having a support illustration. For example, a study (6) found that drawing your own image and then comparing it to an illustration provided by the teacher is more beneficial to learning than drawing alone. The effects of drawing have been demonstrated in combination with scientific texts, but more research is needed to understand its influence on comprehension of other types of texts. In terms of mental images, the literature review mentioned above emphasizes that children should be trained in how to use imagery so that positive effects are seen. One type of effective training consists of instructing children to mentally visualize a word, then a sentence, then a paragraph and then a whole text. Structure words can also be introduced to help with the mental task. For example, instructing students to imagine the number, size, shape, colour, background, movement, etc. In summary, the use of dual-coding has gained popularity in schools. That is, teachers and students are becoming aware that combining verbal and non-verbal information facilitates understanding. New research also indicates that creating mental visualization enhances learning and boosts reading comprehension. When you go to school tomorrow, don’t forget your crayons and your imagination! (1) Clark, J. M., & Paivio, A. (1991). Dual coding theory and education. Educational Psychology Review, 3, 149-210. (2) Godden, D. R., & Baddeley, A. D. (1975). Context‐dependent memory in two natural environments: On land and underwater. British Journal of Psychology, 66, 325-331. (3) Bramao, I., Karlsson, A., & Johansson, M. (2017). Mental reinstatement of encoding context improves episodic remembering. Cerebral Cortex, 94, 15-26. (4) Cuevas, J., & Dawson, B. L. (2017). A test of two alternative cognitive processing models: Learning styles and dual coding. Theory and Research in Education, 1-21. (5) De Koning, B. B., & van der Schoot, M. (2013). Becoming part of the story! Refuelling the interest in visualization strategies for reading comprehension. Educational Psychology Review, 25, 261-287. (6) Van Meter, P., Aleksic, M., Schwartz, A., & Garner, J. (2006). Learner-generated drawing as a strategy for learning from content area text. Contemporary Educational Psychology, 31, 142-166.